May 2009 Meeting. 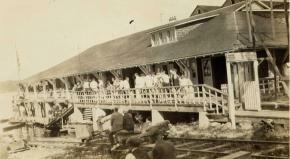 The Centennial of the Hudson Yacht Club 1909 - 2009. By Rod Hodgson. At our May meeting, local historian and author, Rod Hodgson, will talk about the first one hundred years of the Hudson Yacht Club. Using many archival photos and short films, Rod will talk about the early days of the Club, the heyday of the wooden yachts, the swimming pool and the club activitiies and achievements over the years. The evening promises to be a gala start for the Hudson Yacht Club Centennial year of 2009 and the Hudson Historical Society extends an invitation to members of the HYC past and present to join our meeting. The meeting will be on Monday, May 11th 2009 at 7:30 pm at St. James’ Church Hall.